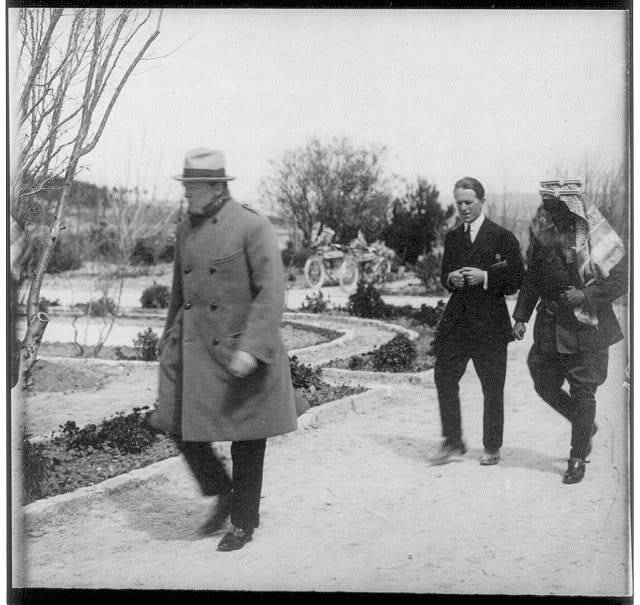 The great British leader Winston Churchill visited Palestine in 1921, relatively early in his career while serving as Colonial Secretary. He was attending a conference in Cairo, and, according to Churchill, he was invited to Jerusalem by his friend the British Commissioner for Palestine, Herbert Samuel. 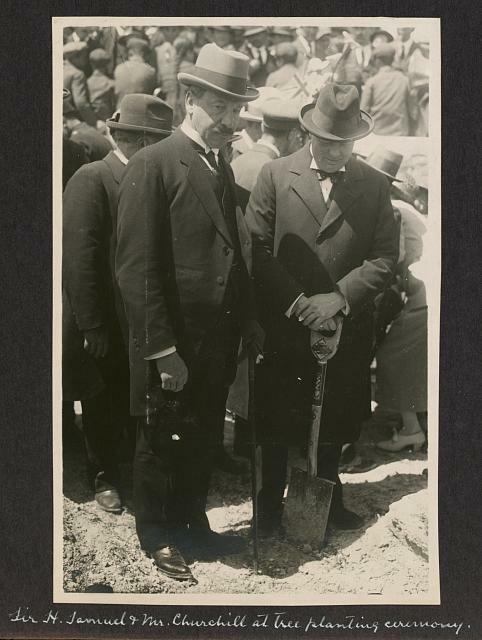 While in Jerusalem he attended a tree-planting ceremony at Hebrew University on Mt. Scopus with Sir Herbert Samuel. 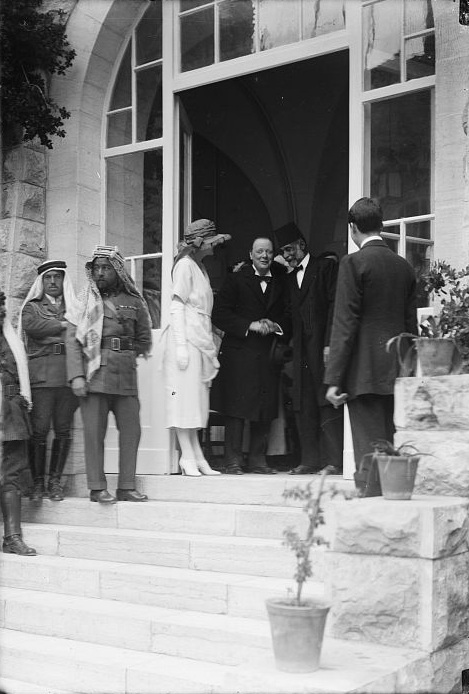 Churchill's most important meeting -- related to the division and leadership of the post-war Middle East -- was a secret meeting with Emir Abdullah (later King Abdullah of Transjordan) and T.E. Lawrence (Lawrence of Arabia). A photograph from the meeting was preserved in the Library of Congress collection. He also met with the Muslim, Christian and Jewish religious leadership of Jerusalem. In an incredible film clip, Churchill takes leave of the leading rabbis of the time, Rabbi Abraham Isaac Kook, Chief Rabbi of the Ashkenazic community; Rabbi Joseph Chaim Zonnenfeld, Chief Rabbi of the ultra-Orthodox Eidah Charedis community; and Rabbi Jacob Meir, chief Rabbi of the Sephardi community. To the left of the door is Emir Abdullah. 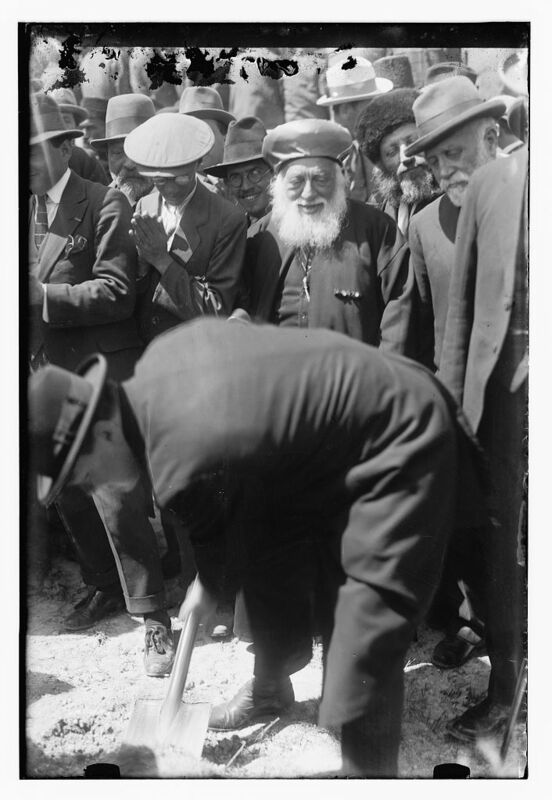 Note the faint recognition Rabbi Kook gave him and Abdullah's lengthy gaze at the departing rabbi. What does it signify? We will probably never know. In January 1925, Rabbi Zonnenfeld traveled to Amman to meet with Abdullah, his father King Hussein of the Hijaz and brother King Faisal of Iraq. Churchill also met with a former mayor of Jerusalem and Arab leader, Musa Kazim el Husseini. Husseini was related to the Jew-hating Mufti Haj Amil el-Husseini and father of the notorious Arab militia fighter, Abdul Khadar el-Husseini. The Husseinis' hatred of Jews was only matched by their hatred for King Abdullah, and Husseini clan members were involved in Abdullah's assassination on the Temple Mount in 1951. Musa Kazim el Husseini petitioned Churchill to stop the immigration of Jews into Palestine and claimed that life for the Arabs was better under the Ottomans. Churchill responded with his famous rhetorical brilliance, defending the Balfour Declaration and the reestablishment of the Jewish homeland. To my regret you are painting Churchill and Lawrence in a positive light. I would like to point out that it was Churchill who made it clear that the British did not support a separate nation as a Jewish National Home, only a continuation of the community within the Palestine region. Notwithstanding these assurances, in July 1922 the British partitioned the area of the Palestine Mandate by excluding the area east of the Jordan River from Jewish settlement. That land, 76% of the original Palestine Mandate land, was renamed Transjordan and was given to the Emir Abdullah to rule. Fact is that all our problems today in the ME derive from that fateful deceitful decision. Actually, the first partition deicsion referred to above was indeed one of the main points of the 1921 visit to Jerusalem, when Churchill told Abdallah he was to become the Emir of TransJordan. And was it really a "secret" meeting with all those people in attendance or just the conclusions? Watch the historical clip on developments in Palestine from 1917 to 1919 ending with the Agreement signed in France by Weizmann and Faisal.